Submissions must be received by September 14. Chosen entries will be displayed at Congregation Shaarey Zedek. Address changing boundaries in helps us begin to heal the brokenness in our world. We are excited to launch the first ever CSZ Sukkahville Competition. CSZ families are invited to participate and reimagine the ancient structure known as a Sukkah, which has been built during the Jewish harvest of Sukkot since biblical times. The original source for this tradition is Leviticus 22:26-23:42, where the children of Israel are called to dwell in the booths (Sukkot) for seven days. The twist on this competition is that you only need to build a mini sukkah – not to exceed 1 ft. x 1ft. in height or length. The theme for the competition is “release and renewal”, and the canvas to express these themes is the Sukkah. We’re interested in exploring how this space can express and advance ideas of community engagement, social justice, and sustainability. Each Sukkah is required to adhere to a list of guidelines: the structure must be temporary; it must have at least two-and-a-half walls; it must be big enough to contain a table and most of a person’s body*; and it must have a roof made of shade-providing organic materials through which a person can see the stars, but the Sukkah must be still more covered than it’s not. 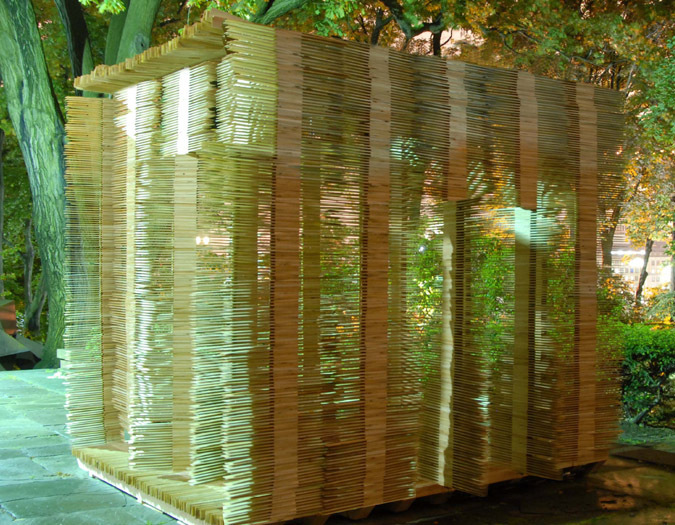 While it is a mitzvah to build a Sukkah, the act of building such a temporary structure also inspires us to think about the concept of dwelling. We are asking you to propose an innovative Sukkah design, which delicately balances the inherent dichotomies such as new/old, open/closed, and temporary/permanent is the challenge in this competition. The design competition will blur the boundaries between the sacred and the secular by turning halacha (Jewish law) into rules for a design competition and making a holy festival a catalyst for a discussion about politics and social mores. Please contact Allison Gutman at 248.357.5544 x 43 or email agutman@shaareyzedek.org for more information. *Person’s body will be represented to scale with a standard Bic pen. This entry was posted in Events, Youth & Families and tagged sukkah, sukkahville. Bookmark the permalink.